Completely covering your boat and outboard is essential during the winter months. A separate outboard motor cover is usually required as most boat covers only cover the boat itself unless it is tailor made. The best outboard motor cover is the Wake “M1″Trailerable Cover that comes with 5 years warranty and is both UV and mildew resistant. Protecting the outboard motor whilst it is being transported on the road, water or even being stored is important to prevent scratching and other dirt building up. Marine graded waterproof polyester that is double stitched for durability is highly recommended. Many people will decide to make their own covers but will not factor in aspects such as breathability, UV protection or waterproofing. Universal fitting of outboard covers are fairly compatible most sizes due elasticity and adjustable straps features for a snug fit. Bird dropping stains and UV damage can reduce the resale value of the boat quite significantly but can be prevented easily. Below is a list of the best outboard motor covers to protect against scratching, UV, damp and more. The Wake M1 uses a marine graded woven polyester fabric that is designed to fit close to the outboard for trailering. The high quality polyester is resistant to UV and mildew for the ultimate all year round protection. Available in both grey and blue with outboard sizes ranging from 0 to 300 HP, there is a cover for every outboard motor. As peace of mind, the Wake “M1” comes with 5 years warranty and with the high quality materials, it will last many years more. Overall, it is the best outboard motor cover you can buy and will be as good of quality to those custom fitting alternatives that costs ten times as much. The Leader Accessories ShoreGuard Polyester Waterproof Outboard Motor Hood Cover is made from 300D polyester with a urethane coating. The full cover is double stitched for additional strength and durability. Leader Accessories have focused on designing a water repellent yet breathable outboard motor cover and have highly succeeded. Other useful design features include the convenient side buckles for an easy release. The ShoreGuard is available in both blue and grey with fittings from 0 to 300 HP, which is the same as above. One noticeable difference is the price, where the Leader Accessories is much cheaper and it is the best boat outboard cover for the money. The Classic Accessories outboard motor cover uses a heavy duty steelex fabric that is designed for heavy weather protection and extra durability. The brand Classic Accessories is reputable and produce some of the best boat covers for all weathers, so the outboard cover has got reputation to live up to. There are sizes from 25 HP to 225 HP and the outboard cover is tighten for a snug fit using the webbing strap and side release buckles. For peace of mind, this cover has a 4 year limited warranty against material damage. It is very similar to the dealership styling but without the cost, which makes it very desirable to many boat owners. The Komo Covers alternative is a draw string closing cover, which makes a snug fit much easier than most. It is double stitched, UV coated and water repellent, which is the three most important factors. There isn’t as much choices in terms of sizes with fittings for up to 100 HP but like the others, it is available in both blue and grey. With the hem cut-away and draw string, it is the best fitting outboard cover before purchasing a tailor made alternative. Komo have aimed to produce an all-round good outboard cover and they have achieved exactly that. It is reasonably priced and the draw string feature is the unique selling point but time will tell how long it will last. The waterproof outboard cover is a later redesign to fit the newer cowl sizes and later outboard constructions. Like the alternatives, it is mildew and UV protected for superior protection against the damp environments. It lacks color options and is only available in the standard grey but there are plenty of size options to fit a range of outboards. In terms of providing a tight fitting around the outboard, it uses a draw rope in the hem to tighten. The price is slightly inflated but the extra means a better quality material and this outboard motor cover has a heavy canvas for great protection. 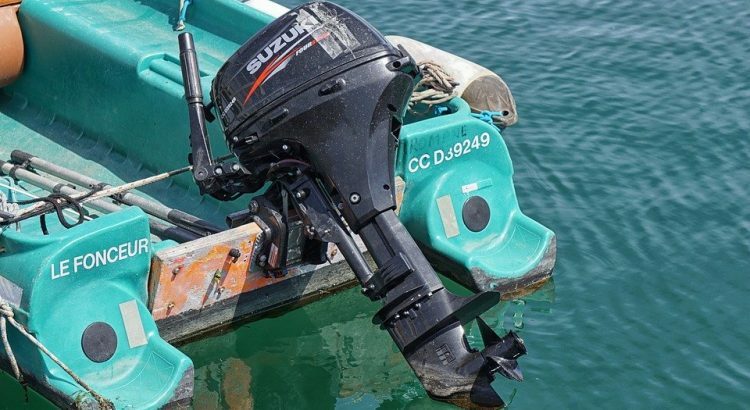 On many boats, the main investment and most expensive part of their boat is the top rated outboard motor attached to the transom of the boat. Unfortnately, many boat covers do not cover this part of the boat and this leaves the outboard exposed to all the environments. Bird droppings, UV damage and general damage is caused to the outboard motor when it is not protected with a cover. There is a wide ranging design and colors available to the savvy boat owner and will add to the boat package when you come to selling the boat (if you do). Of course, not ever outboard cover is the same and there are a range of factors you should be aware of, as shown below. The purpose of the cover is to protect the outboard from damage when in storage or be trailered on the highway. The winter is a tough season for anything outside and investing into a high quality cover for your outboard will reduce the wear and tear. To increase the protection, many manufacturers will use material that is water repellent and prevents damage from UV rays. Polyester is the most popular material as it is cheap, does not shrink or stretch, can breathe, waterproof and many other benefits. Other fabrics are stellex, vinyl and more but polyester is the material to go for. Breathability is a feature that many materials cannot do efficiently but polyester can and it prevent the buildup of condensation and mildew. If a cover is not able to breath, the mildew and condensation will be stuck against the motor and could cause corrosion, which is not a cheap repair. When it comes to universal fitting for outboard motor covers, many people think of one size that will not provide a snug fit. This is untrue because many include snap on brackets, draw strings, Velcro and more as a way to tighten the cover. The majority of covers will avoid the boat propeller because it will cause damage to the cover itself. If the cover does cover the propeller, ensure you attach the padded section to the propeller so it does not tear the cover. The main purpose of the outboard motor cover is to protect the outboard motor from damage and corrosion inside the motor. Waterproofing, UV protection, breathability and ease of fitting are four important features that make the best outboard motor covers. Many of the above covers provide these features but ensuring the size and colors meets your expectations is completely up to you. As long as you cover the outboard, you are protecting your investment from becoming damaged and losing value.